You may have heard about this phase or you may already be experiencing it with your 2 year old girl! The ‘terrible twos’ is known as a time when your previously adorable, obedient child starts acting like a rude teenager. Saying “No!” becomes their favorite word. But don’t worry that it’s something wrong that you have done, it’s just part of their normal development. In fact, if your 2 year old is not actively trying to be defiant, you should start worrying a little! Having a 2-year-old kid is also great fun. At 2 years of age, their physical development continues to progress and they can move around a lot quicker on two feet. They are also learning to say words and short phrases and can surprise you with new words every day. They start to show much more interest in other kids and because of this, you may find it more enjoyable to bring them to museums and plays because they interact a lot more. This is also the time where you may start doing research for a suitable preschool (*gasp*) and attend crazy amounts of Open Homes until you can’t stand the sight of another preschool. In this article, we are going to cover some common 2-year-old milestones and then examine some toys which we believe 2-year-old girls will not only absolutely love but will also benefit from in terms of their development. When our child was 2 years old, she could climb not only couches but also ladders. That’s right, the things you used to place on tables to keep them out of reach are no longer safe. This can be super useful if you are training them to clear up after themselves. This can be a good or bad thing, depending on how you look at it. In general, if your 2 year old is running towards you, it’s good. If he or she is running away from you, that’s bad. This is great if you want a child who can play ball with you. Not so great if your 2 year old throws a stone through a window. Your 2 year old may enjoy playing with playground structures such as climbing steps and shooting down slides. Your taxes to pay for these community things are finally being put to some good use, huh? Finally! You have been wondering when your 2-year-old will finally work out that the square pieces don’t fit the triangle hole. This is great because you can introduce your child to coloring activities which usually means that he or she will leave you alone for a while. The caveat: you need to keep an eye out to make sure your child is not coloring on furniture and walls. We have a solution for you for this later on in this article. Keep reading. You can’t hide objects from them now and hope that they will forget all about it. This means that if they see you eating a yummy piece of chocolate cake, you won’t be able to hide it and assume that they will forget that it exists. Ice cream? Your 2-year-old is going to beg for it. Vegetables? Your 2-year-old is going to hate it. Welcome to food struggles. Your 2 year old’s vocabulary should continue to expand beyond “No!”. They should be able to say words with several syllables in it and can even manage 2 to 4-word phrases. Your 2 year old might surprise you by belting out a tune when he or she hears their favorite song. This means that when you say “Don’t touch” and your 2-year-old touches the item anyway, this doesn’t demonstrate a lack of understanding. It just means that they are choosing to disobey you. Your 2-year-old will start to display tantrums as he or she starts to experience frustrations and wrestle with your rules. You may also find that your 2-year-old’s sense of humor continues to expand. Sometimes at your expense. Your 2 year old should be able to recognize familiar faces in pictures and even point them out if you call them by name. A great time to start introducing extended family members to your 2-year-old if you haven’t started already. Grandma will love that your 2-year-old can call her ‘nana’. Your 2-year-old will start noticing other children more and more. They may even acquire ‘older child admiration syndrome’ which is when your 2-year-old wants to copy and bug other older kids. For some of you lucky parents, your child may not have experienced much separation anxiety at all. For some of you other less lucky ones, hopefully, the separation anxiety will start to lessen around this time. Now that you have an idea about the developmental milestones of a 2-year-old girl, it’s time to examine some of the best toys that 2-year-old girls normally love. This is a drawing mat that uses a water pen. You fill the pen with water before you draw with it. The mat is divided into 4 quadrants that produce different colors when water is used on it. When the water dries, the markings disappear. It can be folded for easy storage which makes it a great traveling toy. Why is this a great toy? Most 2-year-olds start to display interest in drawing and coloring around this age. This is a great time to start introducing useful skills for school in the future such as the holding of a pencil, drawing lines and other shapes, coloring and increasing attention spans. However, most parents worry about the destructive potential of paint, coloring pencils and crayons. You probably have seen the horrified look on parents faces when they discover that their little one has drawn their masterpiece on the wallpaper of their bedroom. This water drawing mat takes away the need for you to watch your 2-year-old like a hawk. The worse that could happen is that your 2-year-old spills the water. But this is nothing compared to paint on walls, right? 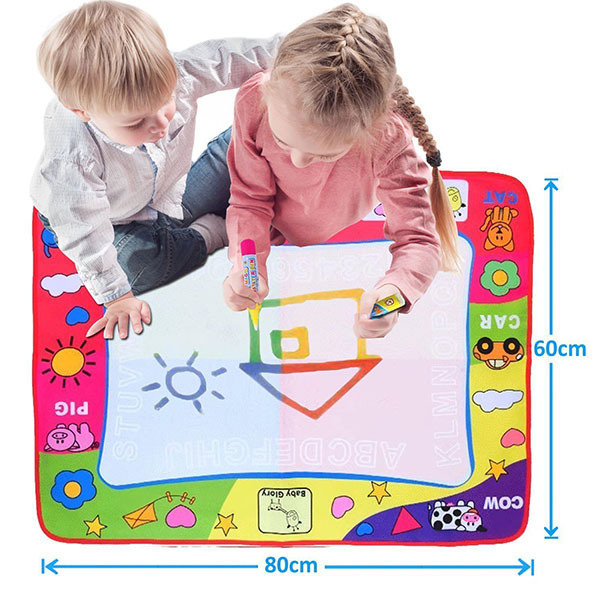 This water drawing mat is also very affordable at its price for the hours of use. Great buy! This is a more fun way for both you and your toddler to go out for walks. 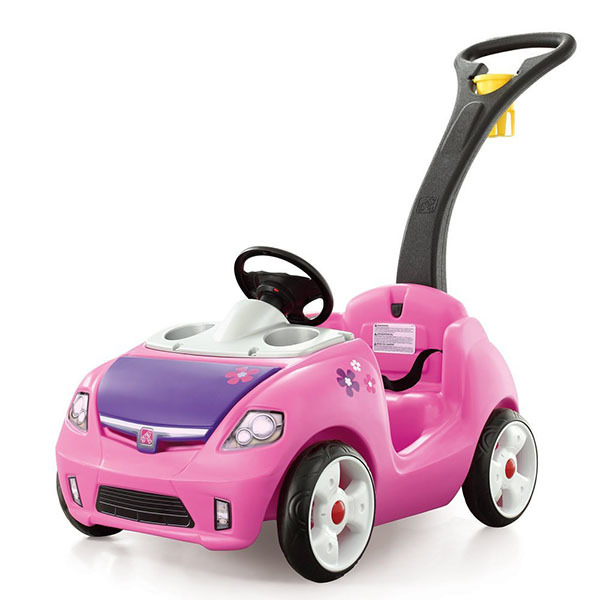 This ride on/push car is in typical girl colors- hot pink and purple. The front of the car has space for two drinks; one for your 2-year-old girl and one for you (can’t forget the mama!) The bonnet comes with extra storage space for other essential items such as toys, snacks, wipes or your keys. This takes a maximum weight of 50 pounds or 22.7 kg. A great way to encourage your 2-year-old girl to get outdoors and get some fresh air. Every girl also dreams of getting her own car someday and at her 16th birthday party, you can display a photo of her in her cute ride on push car to earn some brownie points. 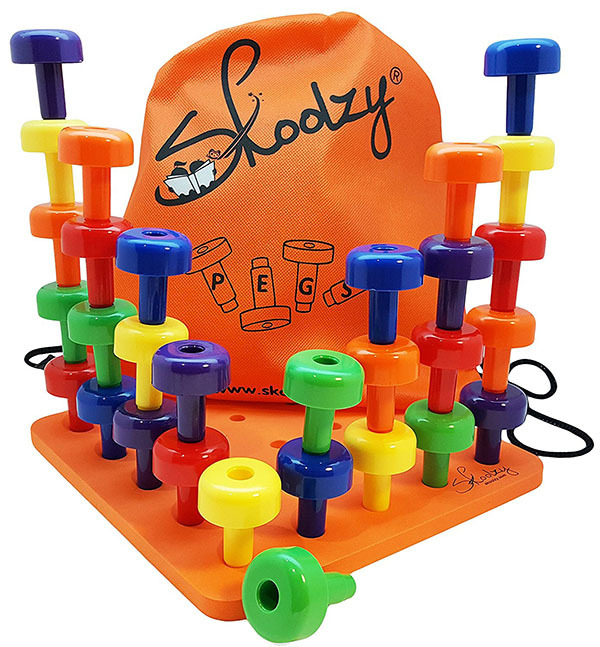 There are 30 large pegs in 6 colors that can be stacked to create interesting structures, towers, and blocks. If you want your girl to develop visual-spatial, patience, focus and STEM-related skills (Science, Technology, Engineering, Mathematics), this is a good toy option. It’s also great for building fine motor skills such as stacking, balancing and color matching. Don’t let the boys alone dominate STEM, we need more girls in it! 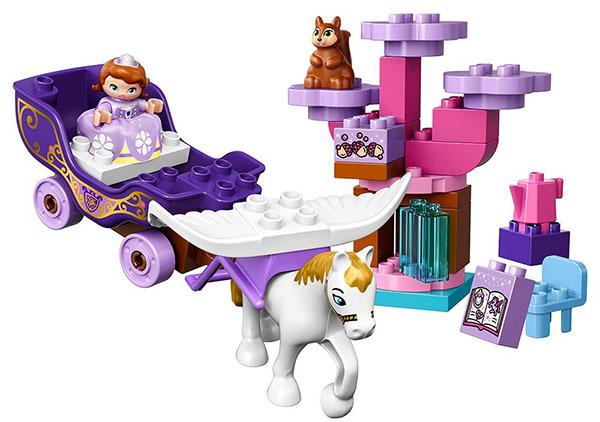 This LEGO DUPLO set comes with Disney Junior’s Sofia the First and a horse and carriage as well as a revolving tree that looks like a castle. If your 2-year-old girl is a fan of princesses and you are a fan of LEGO, this is a good combo of both. LEGO is well-known for its great quality toys and for helping kids acquire creativity, learn building and engineering concepts as well as develop fine motor skills. This book is no ordinary book. 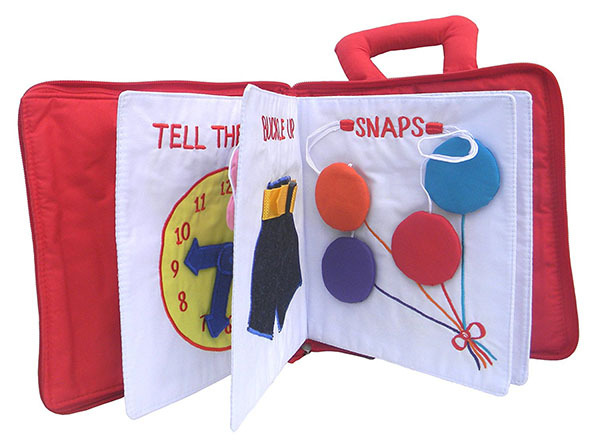 This is a cloth book with different activities on every page that teaches different life skills that your 2-year-old will need to eventually learn such as doing up buttons, lacing shoelaces, reading a clock face, working with a zip and lacing through a buckle. This is a Dr. Toy’s Best Classic Products award winner. It’s also great for flights or car rides. It can be personalized with your 2-year-old girl’s name on the cover and she will love the new skills she acquires. 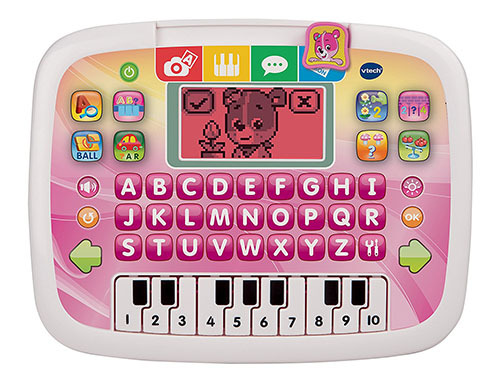 This VTech toy is another fun, yet also an educational toy for 2-year-old girls. It looks like a normal desk and comes with a stool. But it is much more than that. It is actually an interactive activity center that comes with 5 activity pages. These activity pages come with more than 100 teaching words, numbers, shapes and at least 20 musical sounds and songs. The best part is that when you flip the desk cover over, there is a chalkboard underneath and also a clip that can be used as an easel. There is also a toy telephone for pretend play. 2-year-olds love having their own mini furniture created for their height level. The desk and stool will help your 2-year-old feel grown up. The activities are all great for a 2-year-old; learning words, shapes, objects, musical instrument names etc. We love that this activity center basically caters to all the different art mediums that your 2-year-old may want to use including paper, color pencils, paint and chalk. Getting your 2-year-old to sit and play at this desk is also good for training your 2-year-old to get used to a future classroom environment. 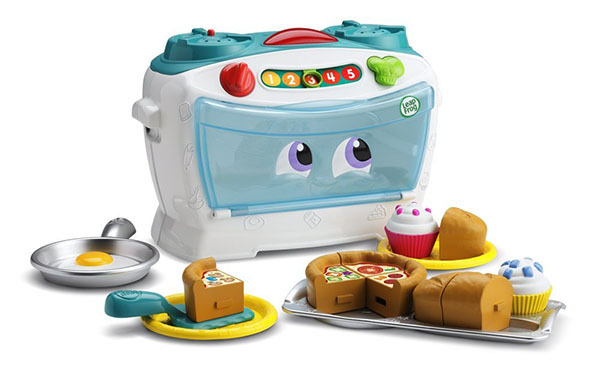 This toy features an interactive oven with delicious looking food including pizza slices, bread, fried egg and cupcakes. The food has numbers printed on them so that you can use them to teach about counting. The interactive oven plays words, catchy songs and phrases. If you have a 2-year-old girl who refuses to eat much food, this could be used as a tool to get your 2-year-old interested in food. This is also useful for teaching mathematical concepts like addition, subtraction and parts. The American Academy of Pediatrics recommends that parents should limit 2-year-olds screen media time to 1 hour a day only. Even then, you may still feel uncomfortable about letting your little one start using an actual tablet. If that is the case, the VTech Tablet is a good compromise for your 2-year-old girl. This is a cute tablet lookalike but instead of an LCD screen, it uses a color-changing LED screen. 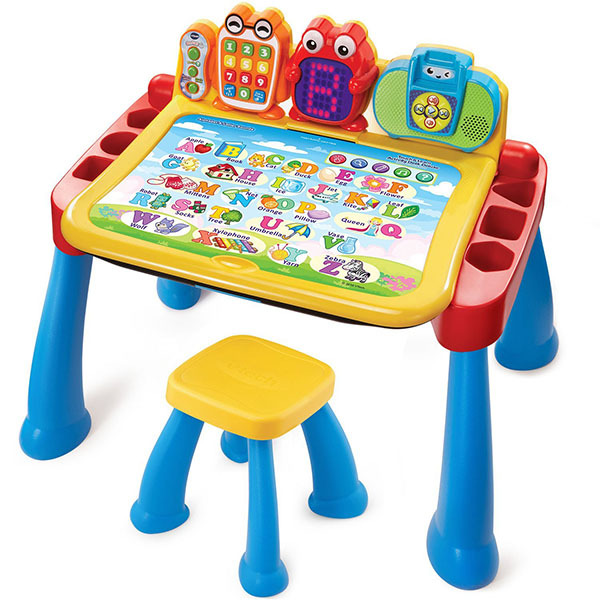 Your 2-year-old can use this tablet to learn letters, numbers, piano sounds, matching and counting. There is also a pretend camera. Every child nowadays wants their own screen device. Enough said. Puppets are fun and a great way to introduce social and emotional concepts to your 2-year-old. You can use it to teach about appropriate and inappropriate behaviors, how to react in different settings etc. This set comes with an elephant, giraffe, tiger and monkey puppets. 2-year-olds love playing make-believe and puppets are also very good for social play with other kids. This toy is great for little girls who really, really want a pet but you are not ready to get them a real one. 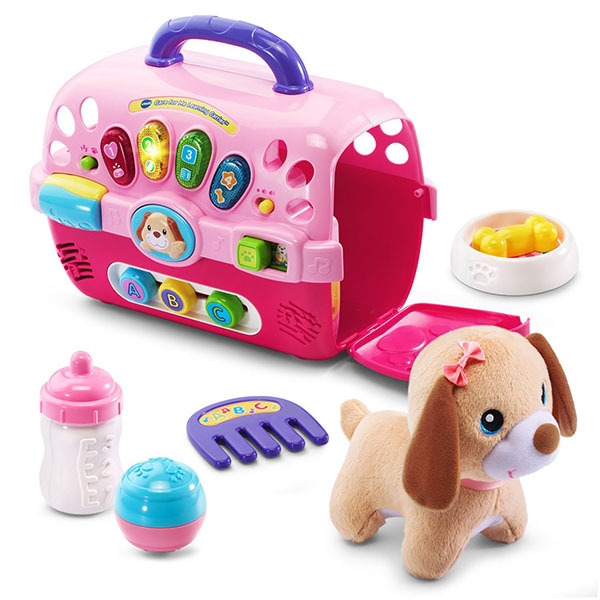 This VTech Care Carrier lets your 2-year-old practice looking after a fake pet before you decide that they (or you) are ready for a real one. This toy consists of a cute huggable puppy who has a fancy carrier/cage. The carrier is interactive and plays over 100 songs and phrases, lights up and also has sliding alphabet beads. There are pet care accessories including a comb, bowl, ball and bottle (for feeding the puppy). Which 2-year-old girl doesn’t love puppies? The puppy can double up as a comfort attachment toy and can also be used for pretend-play. This toy also teaches early responsibility for caring for others as well as the usual alphabets, shapes, opposites and sounds. Depending on what skills you want your 2-year-old to build, you could choose a toy most appropriate for your child. We hope you found our recommendations useful in helping you to find the best toy for your 2-year-old girl.